It is hard to imagine, but the original BMW R100RS was launched in the fall of 1976 as a 1977 model, and is now 40 years old. There have been many variations and iterrations since then, but the original production vehicle still defines the model. At the time of its launch, the RS was a radical departure from other machines of the time. It was a fully faired machine compared to naked machines, it offered bold futuristic styling, and relatively luxurious accommodations to envelope the pilot as he consumed miles by the hundreds each day. A top speed of 108 mph, and 70 hp in a 535 pound machine was a very good performance package at the time. It was a true "Gentleman's Express". The RS started with a recognition by BMW Motorrad that their bikes were sort of....well...dated, and were in danger of appealing only to an older demographic. Their solution was to employ stylist Hans Muth to spruce up the line, and get younger customers excited. He used the wind tunnel to design and then test a multi piece fairing that would look modern if not futuristic. The result was a 5.4% reduction in drag, and a 17.4% reduction in front wheel lift. To put this in perspective, lots of riders of all marques were buying and attaching Windjammer fairings to their machines for touring at the time. However, the R100RS was considered the first production model to come fully faired off the showroom floor. At the time, Motorcyclist's Bob Greene said "In one bold move the Germans have advanced motorcycle styling several years". More than that, the bike offered great protection from the elements. Many consider this motorcycle to be the birth of the Sport Tourer. A special Motorsport edition was later launched with a signature red nose on the fairing, and many RS machines including K bikes and R bikes to the present time, occupy BMW showrooms and enthusiast garages. Which brings us to Todd Trumbore, and the 40 year celebration of the RS. Todd has been a guest author for Classic Velocity, a great motorcycle enthusiast in general, and is well known for his annual rides. He is also known for his R90S 40 year celebration a few years ago. Once again, he has gone above and beyond in bringing Hans Muth to anchor a celebration of his design. The lineup of silver blue 1977 RS machines was spectacular, including serial number 001. 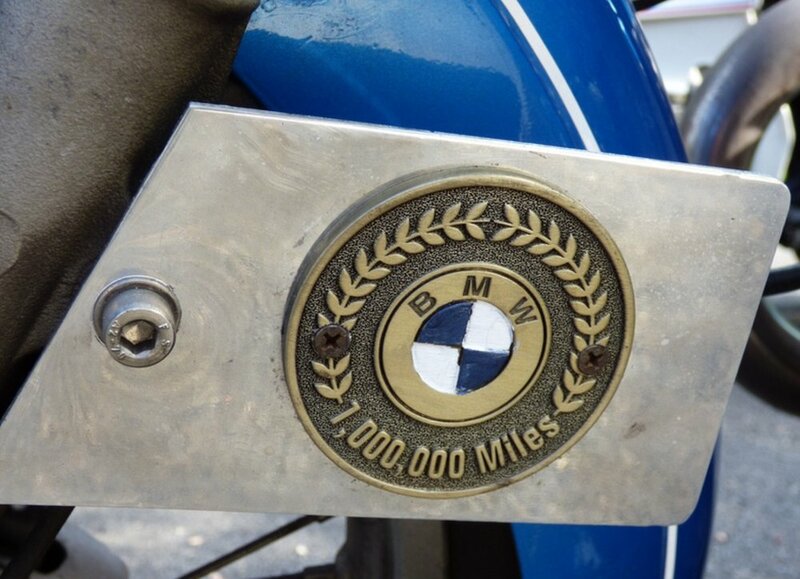 The collection of attendee machines was impressive as well, including a million mile R100S. Camping and tech workshops and lectures, and the Airhead Store, and food and drink, made this a true Rally worthy of the BMWMOA organization. But it was essentially the work of one man. Great guy, great machine, great event.